An education specialist who is a priest of the diocese of Cork and Ross has been chosen by Pope Francis to succeed Bishop Michael Smith in the diocese of Meath. The announcement of Pope Francis’ appointment of Canon Thomas Deenihan was made this morning at 11am following the celebration of 10am Mass in the Cathedral of Christ the King, Mullingar. The Apostolic Nuncio to Ireland, Archbishop Jude Thaddeus Okolo, and Bishop Michael Smith of Meath and Canon Deenihan concelebrated the Mass. Congratulating Canon Deenihan on his appointment, Bishop John Buckley described him as one of the most experienced and highly qualified priests in the Irish Church in the field of education. “There are few, if any, aspects of the operation and governance of Catholic schools that Canon Tom has not dealt with over the past 27 years whether it was chairing Boards of Management, interviewing prospective teachers and principals, or addressing interpersonal problems between management and staff or conducting discussions with the Department of Education and Skills – Canon Tom has done them all with an enviable sureness of approach,” Dr Buckley said. He also highlighted how as chairman of one secondary school board, Canon Deenihan played a key role in the smooth merger of two schools in the same town without acrimony or complaint on the part of parents or teachers – “not an easy achievement after decades of local rivalry in academic and sporting achievement”. Bishop-elect Deenihan was ordained a deacon by Bishop Michael Smith of Meath in Maynooth on 1 April 1990. On 1 June 1991, he was ordained to the priesthood for the Diocese of Cork & Ross by the late Bishop Michael Murphy. Since ordination, he has worked in Glanmire Parish (1991-1994), taught in St Goban’s College Bantry (1994-2003) during which time he also worked in the parishes of Schull, Kealkil and Bantry. He has a Masters and Doctorate in education. In 2003, Bishop John Buckley of Cork & Ross appointed him as Diocesan Advisor for Post-Primary Catechetics and, in 2006, as Diocesan Secretary and Diocesan Education Secretary. He currently holds these positions. On a national level, Bishop-elect Deenihan served as General Secretary of the Catholic Primary Schools Management Association from 2013 to 2016, and as acting-executive secretary to the Council for Education and to the Commission for Catholic Education and Formation of the Irish Episcopal Conference from 2016 to date. Bishop-elect Deenihan is a member of the Honan Governors at University College Cork; a member of Mercy Care South, a Diocesan Public Juridic Person for the Mercy University Hospital in Cork; and is chair of the Board of Directors of the Christian Leadership in Education Office. In 2017, Bishop Buckley appointed him a Canon and a member of the Cathedral Chapter in Cork. In his statement, the Bishop-elect said he was conscious that linked to pastoral ministry is joy. He paid tribute to “the pioneering work that has already been undertaken in relation to sacramental preparation for children not attending Catholic Schools” in Meath and praised Fr Declan Hurley and the experience in Navan. 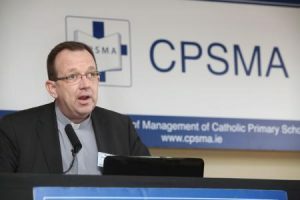 Of Catholic schools, the incoming Bishop of Meath described them as “an important part of the ministry of the Church” and added that the Church must support parents who wish to send their children to a Catholic school. The Primate of All Ireland, Archbishop Eamon Martin welcomed today’s appointment of Canon Deenihan as the new Bishop of Meath. “Bishop-elect Deenihan’s background in education, serving as General Secretary of the Catholic Primary Schools Management Association from October 2013 and as Acting Executive Secretary of the Council for Education of the Irish Episcopal Conference from July 2016, as well as his role as Diocesan Secretary in his home dioceses of Cork & Ross highlights some of the rich experiences that he will bring to the people of his new diocese. I look forward to working alongside Bishop-elect Deenihan in the Irish Bishops’ Conference and I pray that his new patron, St Finian, will guide him in his ministry,” the Archbishop said. Bishop Smith in a statement said he believed the appointment of Bishop-elect Deenihan would “greatly benefit the Church in the Diocese of Meath and will also contribute significantly to the work of the Irish Episcopal Conference and its commissions and agencies”. In his statement of congratulations, Bishop John Buckley said that over the past 27 years of his priesthood, Canon Tom Deenihan had held a variety of appointments that have prepared him well for his new duties as Bishop of the historic Diocese of Meath.